The Perfect Summer Birthday Party With Restaurant Connection! If you’re planning a birthday party for yourself, a family member, or a friend, you’re probably overwhelmed with the amount of forethought you’ll have to put into throwing the perfect event. You’ll have to order the cake, put up the decorations, plan a few games, and cook enough food for everyone who will be attending. While it can be thrilling to plan a big celebration, you can easily become overwhelmed by the amount of preparation that your party will require. Check a major task off of your list and have the party catered by Restaurant Connection! We’re proud to offer our services to Warren, Michigan and surrounding areas. Contact Restaurant Connection to get started planning your birthday party today! Part of the stress of planning a party is making all of the food. Even if you’re just serving a few finger foods and drinks, just buying enough food for everyone can be overwhelming and mean you’ll be spending weeks perfecting the menu. And, if you want to serve a casual dinner, you’ll be stuck in the kitchen preparing and planning for hours on end. It can take the better half of the day to simply purchase everything that’s needed from your local grocery store, not to mention an exorbitant amount of money spent. When you start planning your next birthday celebration, make it easier and more fun for everyone and order food from Restaurant Connection! We offer menus from both local and chain restaurants, so you’ll be able to easily choose the exact fare that you would like to serve. Once you’ve made your selection, you can choose a time to have the food delivered and then move on to decorating and preparing for the person of honor, as well as the birthday guests. Don’t let the stress of planning a beautiful birthday celebration for a dear friend or loved one drive you to tears. 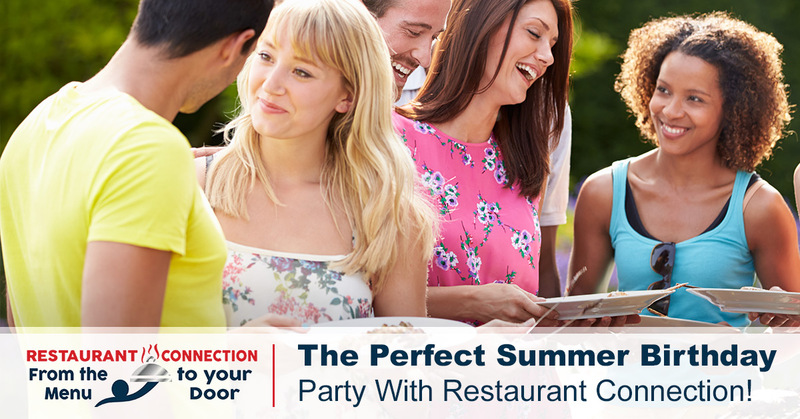 Restaurant Connection will be able to help you plan the perfect birthday party. Whatever fare you’ve chosen to serve, you can be sure that Restaurant Connection will have everything that you need. Browse our huge selection of both local and chain restaurants so you can choose the ideal selection of foods for everyone attending. When you’ve made your decision, you only have to order one day (at least 24 hours) in advance and then wait for our helpful food delivery service drivers to deliver it! It’s that easy! Don’t stress out about purchasing enough ingredients to serve an incredible dinner. You’ll be able to choose the appetizers, entrees, desserts, and whatever else you’d like to serve at your event from our menu and then, instead of having to make everything yourself, you’ll only have to open the door when the food arrives. This will completely change your next event and keep you from being overwhelmed with the amount of food that you have prepare. You’ll be able to hang out with your family and truly focus on the guest of honor instead of spending the entire party running in and out of the kitchen. With Restaurant Connection, you’ll only be responsible for arranging the food! Why wouldn’t you want to use our food delivery service for your next birthday party? If you’re planning a larger party and searching for the perfect caterer in Warren, Michigan, look no further than Restaurant Connection! We can offer our food delivery service for up to 500 people and include plates, utensils, and serving spoons for every dish. You won’t be responsible for washing a single dish, and you’ll only have to purchase beverages and then you’ll be completely done with the food choices for the birthday party. Instead of using every dish in your home to serve and plate food, you’ll be able to simply throw everything away after the last guest goes home and still get a great night’s sleep! With how easy Restaurant Connection’s catering makes parties, you might find yourself throwing more than you even imagined! Birthday parties are a great time to make memories with friends and loved ones. Spend more time with your guests and less time in the kitchen with Restaurant Connection! Order online today!